Symptomatic aortic pathologies require urgent treatment regardless of localization. In these cases, besides open aortic repair, endovascular aneurysm repair (EVAR) is a feasible treatment option with growing acceptance, especially for high-risk patients. When the visceral aorta and its branches are involved, thus compromising the sealing zone, fenestrated EVAR is indicated.1 Custom-made devices are unsuitable for treating urgent cases due to long manufacturing times. Thus, on-site physician modification of endovascular grafts for branch vessel preservation is an alternative treatment strategy for acute aortic pathologies localized in the thoracoabdominal aorta.2 However, endovascular treatment using fenestrated stent grafts requires complex planning, usually based on the centerline of the aortic flow, which does not account for the interaction between the stent graft and the angulated aorta with the possibility of modifying the alignment between the fenestrations and the ostia of the visceral vessels.3 Furthermore, the seal of the stent graft might be compromised, leading to endoleak, which might be fatal in cases of acute aortic pathology. Other potential barriers to more widespread use of physician-modified stent grafts (PMSGs) are the time required to map the opening locations to the endograft and the questionable accuracy of the placement of the openings. Thus, reliable and efficient graft planning is necessary. Three-dimensional (3D) printing has been increasingly used in medicine to create models of complex cardiovascular pathology. 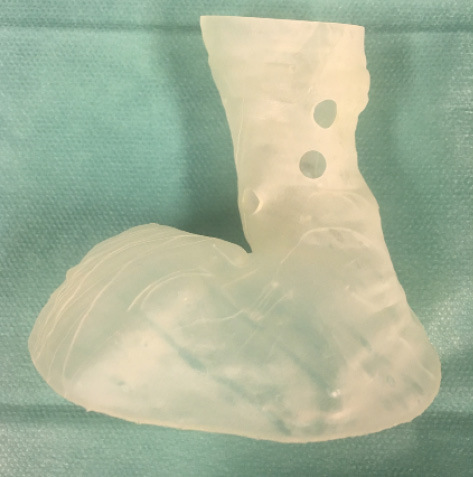 In 2015, Leotta and Starnes successfully tested a 3D-printed rigid sleeve of the proximal neck of the aorta to treat a phantom juxtarenal aortic aneurysm.4 The first clinical application of this concept was performed by Huang et al, when they printed a 3D overlay of a juxtarenal aortic aneurysm, creating fenestrations on a fully expanded stent graft.5 This method might lead to misalignment of the fenestration in vivo because the oversizing of the stent graft over the original aortic diameter is not taken into consideration. To eliminate this disadvantage, a 3D-printed hollow tube of the aorta would have the potential to simulate stent graft expansion in vivo, increasing the accuracy of the placement of the fenestrations. The feasibility of this concept has been demonstrated by Rynio et al in a patient with an asymptomatic aortic arch aneurysm, when they created a 3D-printed hollow aortic arch with orifices for the supra-aortic vessels.6 After loading the stent graft in the sterilized 3D model, a fenestration and a scallop were created to achieve the desired proximal landing zone. At our center, we have standardized the creation of 3D aortic models using the following protocol. CTA images are used to create a 3D aortic template with Mimics 16.0 and 3-matic 6.1 software (Materialise NV) that replicates the acute aortic pathology, as well as the proximal and the distal landing zones of the aorta. Round openings that are 6 mm in diameter are planned at the locations of the branch vessel origins (Figure 1). We use the Form 2 3D printer (Formlabs, Inc.), which is based in our hospital, to produce a clear, rigid model made from biocompatible Dental SG resin material (Formlabs, Inc.) that includes 6-mm holes at the locations of visceral vessels (Figure 2). The inner lumen of the model is planned to have the same diameter as the aorta. The thickness of the wall of the aortic model is 1 mm. Finally, the 3D aortic model is sterilized using steam pressure. According to our experience, the total manufacturing time of the unsterile 3D aortic model is approximately 6 hours. Figure 1. A 3D aortic template created based on thin-slice CTA of a patient with a symptomatic, 9-cm juxtarenal aortic aneurysm. Figure 2. 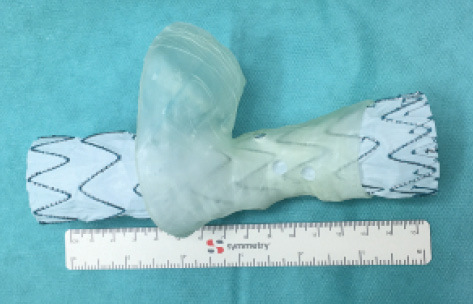 A 3D-printed biocompatible aortic model of the proximal neck of the juxtarenal aortic aneurysm. Figure 3. A stent graft placed inside the sterilized 3D biocompatible aortic model in order to mark the fenestrations. Exclusion of the acute complex abdominal or thoracoabdominal aortic pathology is performed in a hybrid room under general anesthesia and with percutaneous access. Most of the time, we choose a 150-mm–long Valiant Captivia closed-web thoracic stent graft (Medtronic) with 20% oversizing over the proximal aortic neck as a base for the PMSG. 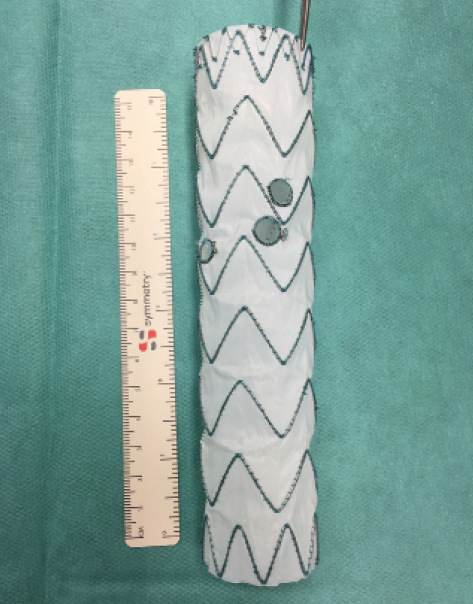 On a back table, the Valiant Captivia closed-web thoracic stent graft is introduced into the 3D-printed biocompatible aortic model, unsheathed, and completely deployed into the model. Under direct visualization, the stent graft is rotated so that the fenestrations are localized in a strut-free area of the stent graft (Figure 3). The locations of the four openings are marked with a sterile pen, and the graft is removed from the template. Using a surgical scalpel, two 8-mm fenestrations are created for the origin of the celiac trunk and superior mesenteric artery (SMA), and two 6-mm fenestrations are created for the renal arteries. All fenestrations are reinforced with 6-0 Ethibond sutures (Ethicon, a Johnson & Johnson Company) and radiopaque markers using the tip of a V-18 ControlWire guidewire (Boston Scientific Corporation). The lateral “8” markers are removed from the upper part of the thoracic stent graft and are sewn at the level of the SMA fenestration and lowest renal fenestration (Figure 4). The PMSG is visualized under fluoroscopy to document the position of the fenestrations and markers in the unsheathed state (Figure 5). Then, the PMSG is soaked in a rifampin solution for 10 minutes and resheathed using umbilical tape. 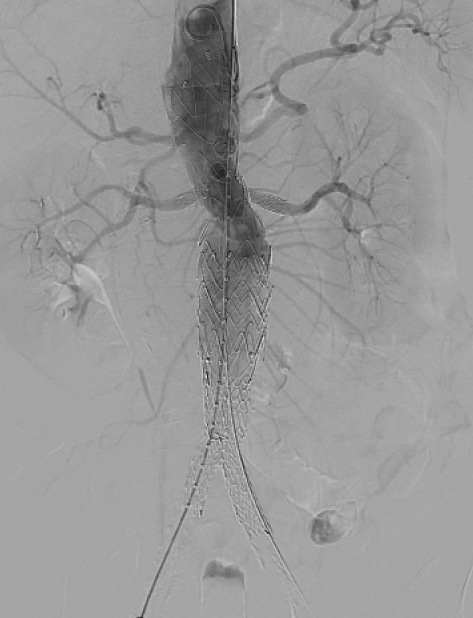 The PMSG is deployed into the patient’s aorta with alignment of the SMA and left renal artery for reference. Alignment of the fenestrations is verified by performing continuous fluoroscopy as each branch is cannulated with a guidewire introduced from the left brachial artery. 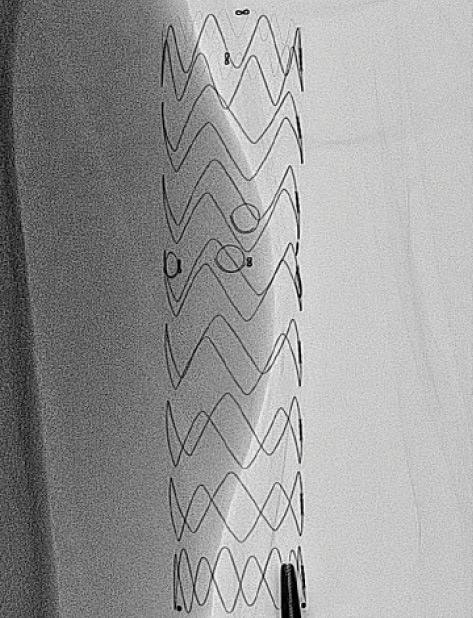 Balloon-expandable covered bridging stents are placed in the fenestrations and their corresponding target arteries with ends flared. Final digital subtraction angiography and predischarge CTA are performed to assess the patency of visceral branches and the presence of endoleak (Figure 6). Figure 4. 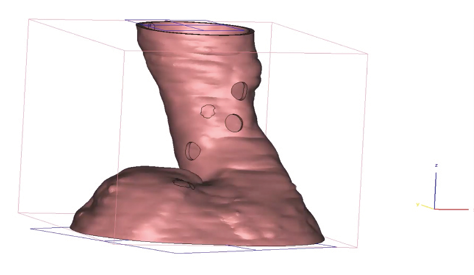 A PMSG with four fenestrations for all visceral vessels based on the 3D hollow aortic model. Figure 5. Fluoroscopy of the PMSG, showing the positions of different markers in the unsheathed state. Figure 6. Final angiography showing complete exclusion of the symptomatic juxtarenal aortic aneurysm after urgent implantation of a PMSG with four fenestrations manufactured based on a sterile biocompatible 3D model of the patient’s aorta. The endovascular treatment of complex abdominal and thoracoabdominal aortic pathologies requires complex, patient-specific planning based on the centerline of the aortic flow. Reliable graft planning can be performed using 3D aortic models based on the raw CTA data from the patient. Furthermore, after careful examination of the aortic model, an optimal interventional strategy can be developed and difficulties that might arise during the endovascular treatment can be anticipated. 1. The transparency of the material allows for accurate positioning of the fenestrations in strut-free stent graft areas; thus, the potential for measurement error is eliminated. 2. After deployment in the 3D hollow aortic model, perfect replication of the native aorta (including angulations and diameters) allows the stent graft to mimic the in vivo intra-aortic position. Therefore, the locations of branch vessel openings are more precise than those determined from the vessel origins visualized in CTA images alone. Last but not least, the short manufacturing time of the 3D-printed aortic model (approximately 6 hours) allows the urgent use of this technology for urgent cases. 1. Erbel R, Aboyans V, Boileau C, et al. 2014 ESC guidelines on the diagnosis and treatment of aortic diseases: document covering acute and chronic aortic diseases of the thoracic and abdominal aorta of the adult. The Task Force for the Diagnosis and Treatment of Aortic Diseases of the European Society of Cardiology (ESC). Eur Heart J. 2014;35:2873-2926. 2. Scali ST, Neal D, Sollanek V, et al. Outcomes of surgeon-modified fenestrated-branched endograft repair for acute aortic pathology. J Vasc Surg. 2015;62:1148-1159.e2. 4. Leotta DF, Starnes BW. Custom fenestration templates for endovascular repair of juxtarenal aortic aneurysms. J Vasc Surg. 2015;61:1637-1641. 5. Huang J, Li G, Wang W, et al. 3D printing guiding stent graft fenestration: a novel technique for fenestration in endovascular aneurysm repair. Vascular. 2017;25:442-446. 6. Rynio P, Kazimierczak A, Jedrzejczak T, Gutowski P. A 3-dimensional printed aortic arch template to facilitate the creation of physician-modified stent-grafts. J Endovasc Ther. 2018;25:554-558. 7. Branzan D, Winkler D, Schmidt A, et al. Three-dimensional aortic model to create a fenestrated stent graft for the urgent treatment of a paravisceral penetrating aortic ulcer [published online December 7, 2018]. JACC Cardiovasc Interv.